I have done various distances at the Potomac Pedalers’ Backroads Century event for several years. Until last year, the ride was based in Berryville VA. The people, and sheriff, of the greater Berryville area were not very receptive to having 1,500 bicyclists invade their little corner of the planet, however. 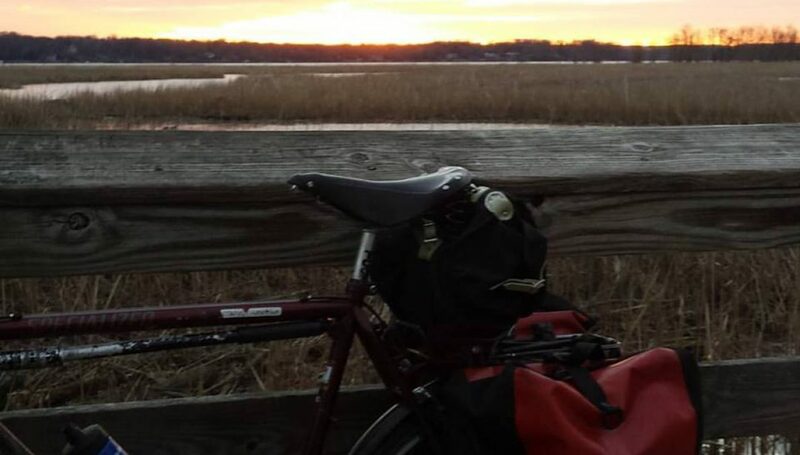 After much frustration and many complaints, Potomac Pedalers moved the ride in 2015 to Shepherdstown in the eastern panhandle of West Virginia. I was out of town for last year’s event and have been eager to check out the new routes. Pre-ride nutrition is important. I had Italian food for dinner with a massive American pale ale. In fact the glass was so big that I could barely get my hand around it. The food was meh but the beer was yay. So after dinner I walked to a gas station convenience store in the dark to get me some more. The area of Martinsburg where I stayed may be a pedestrian nightmare but the beer selection was not half bad. After a drive to the ride start in the dark, Deets and I were on the road by 7:15. It was barely light out. The route took us along the Potomac River for several easy miles before climbing a bit until we were riding along the Shenandoah River. The eastern panhandle is not mountainous like most of West Virginia, but it does have small hills. We rode up most of them. And down. And up. Etc. Only a couple of the hills during the day made me consider walking. But I didn’t. I just ground them out. One by one. In between there were fields of corn and soybeans and apple orchards and cows and horses. Sweet. I saw several people from #bikedc. Michael (the co-leader of our 50 States 2014 ride group), lawyer Mike, Dave and Jean aboard their monster tandem, Felkerino, and several people from the previous two event ride I’ve done this month. Mostly we chatted at rest stops. They humored me for various lengths of time while riding. On the steepest downhill, a ride immediately in front of lawyer Mike crashed. Mike stopped and went to his aid. I joked later that he offered legal advice. This is not true. He offered reassurance and found a rider in the throng who happened to be an MD. Bike Crash had first aid withing a minute of crashing. Tomato and cucumber sammiches are to die for. So are baked potatoes with salt and butter. Young fawns are awkward runners. I rode alongside one for a few hundred yards today. Even strong riders get cramps on hot, humid days. Dave was dogged by them for most of the ride. I saw another rider stopped in the road massaging the backs of her thighs. I offered to help but she hit me with her pump. The volunteers who put up signs, marked the route with arrows and danger warnings, staffed the rest stops, and marshalled the ride did a wonderful job. The packs of riders did not rudely buzz past me once today. Good on you! Instead of rain we got heat and humidity. Eating popcorn the night before a ride is a bad idea. Clueless, chatty people who block your way while riding up a steep hill when you have a ton of momentum going deserve really hot food at the last rest stop. A rider near me was not wearing a helmet. A course marshall yelled at him for his infraction from about 50 yards away. This was obnoxious and spoiled the mood for solitary riders(i.e.me) who like to zone out. What exactly was the marshall going to do about it anyway? When I have an annoying but innocuous shifting problem that I resolve on the fly, I do not need to be told how to shift by a course marshall. I’ve been doing this longer than you’ve been alive, bucko. (I actually soft pedaled for a quarter mile to get away from this marshall. The after party is a great idea. It’s an even better idea to have liquids. Water, tea, and milk were the choices. They were all gone when I got there. Being unable to find your car after the event is not good. I had given up and was riding in search of campus security when I rode passed by car right where I left it. All the lots looked the same to me. All in all, it was a pretty darn good day on the bike. I liked this ride much better than the Berryville version. Posted on September 18, 2016 September 18, 2016 by rootchopperPosted in #bikedc, Backroads CenturyTagged #bikedc, Backroads Century, Potomac Pedalers, Shepherdstown. Next Next post: It’s Clinchmas!